This site was set up in appreciation of the work of Anne Bancroft, althought there are other Anne sites scatttered over the net, most are very small and the ones that are larger are often shared by other subjects. Our aim is to offer a collection of Anne-related information to her fans and to bring the work of Ms Bancroft to a larger audience. Why did you choose the name 'Miracle Worker? We wanted a name that suggested Ms. Bancroft's exceptional talent while at the same time alluding to her illustrious career. 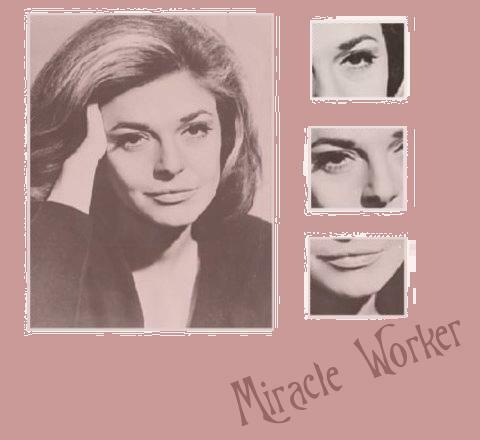 As she won both a Tony and an Academy Award for her role of Annie Sullivan in The Miracle Worker it seemed an appropriate title. No, we are entirely unofficial and not affiliated in any way with Anne Bancroft, her family or estate. This is a non-profit fansite. Where can I buy/see Ms. Bancroft's work? If you're looking for one of Ms. Bancroft's movies that's still in print then I'd recommend Amazon, the marketplace of which is also pretty good for locating second-hand copies of harder to find out of print material too. Otherwise a search on eBay may well yield results. The site was opened here, at Enamoured at the end of June 2005. Can you add "such and such" to the site? I'll be happy accept requests for new items and/or new features. Just let me know what you have in mind and I'll try to implement it as soon as possible. A fanlisting is a place for all fans of a particular movie, singer, or in this case actress, to come together. It is a web clique that lists fans of a particular subject. Unlike most web cliques, a person does not need a web site in order to join. Fans from around the world submit their information to their approved fanlisting and they are then listed to show their love for the subject. A mini site's are members of The Mini Sites Network, which aims to gather together a directory of links to fansites with good layouts and lots of content. I saw a mistake on one of your pages. But you probably already know about it, right? No, I don't. If you see a mistakes on any of my pages I'd really appreciate it if told me right away. You can use the contact form for speed. What programs do you use for this site? All programs used are listed on the Credits page. We are currently very happily hosted by Arkadina Web Hosting.